Lately I'm really busy. So no time to make a new post . This time I have the opportunity to make a post. * Dancing ... Lalala ~ ... *. 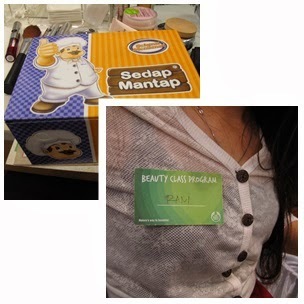 I'm late posting about beauty class held by The Body Shop. Beauty class is held on Nov, 16th, 2013 at 10.00 Am - 12.00 Pm at Palembang Indah Mall (PIM). When it comes to the beauty class, I was welcomed friendly by The Body Shop . I was given a snacks box and a name tag. In fact, I join this beauty class is absolutely free. Starting from the product description, product function, and skin type. When the quiz, I and Ersa win the quiz and get a product from The Body Shop. Body Shop provides clean make-up equipment and skin care products. The participants are free to try the tester products. Her name is Inggit. She is my friend in cyberspace and blogger. The Body Shop is very caring and helping the participants how to use make-up and skin care. Oh ya be, aku nominasiin kamu Liebster Award ya. Be.. pas kamu kirim message fb ttg beauty class ini, Aku lagi sibuk revisi tugas akhir... jd aku ga buka2 fb dan ga tau kamu krm message..